Have you guys watched Watchmen? Well if you haven't you better do it soon. Coz believe me there's nothing that you that wouldn't like about this movie. It's not at all an action-pack thriller comic sci-fi kind of movie, it's more a drama with lots of emotion being bounced of in the tug of war between power of good and evil. How someone cannot be simply GOOD & KIND all the time, and there will always be that gray area that we sometime step into. 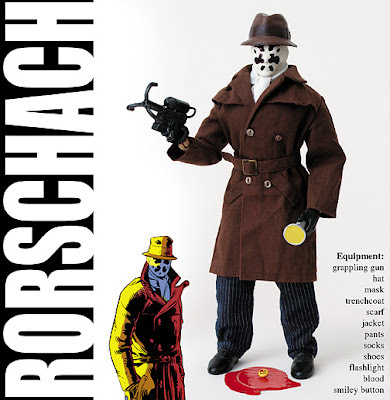 It's kinda sad in the end, particularly for me because I love Rorschach's character. Despite of his brute looks, and most likeliness of not stepping into the shower for more than a year, but he's got a good heart. Very intent to make things right, the one vigilante do-gooder who is a nutcase; driven by vengeance and sees that evil must be violently punished. My bad boy. It's also an interesting fact that (in the original comic) that he started to wear his mask after reading upon the murder of Kitty Genovease, disgusted of the crime rate of New York he worked up Rorschach's character and became his own version of a superhero. Kitty was violently stabbed near her flat with random (said to be 38) witnesses hearing or seeing the assault but did not nothing to help. Is our world any better nowadays? Kinda scary hm? 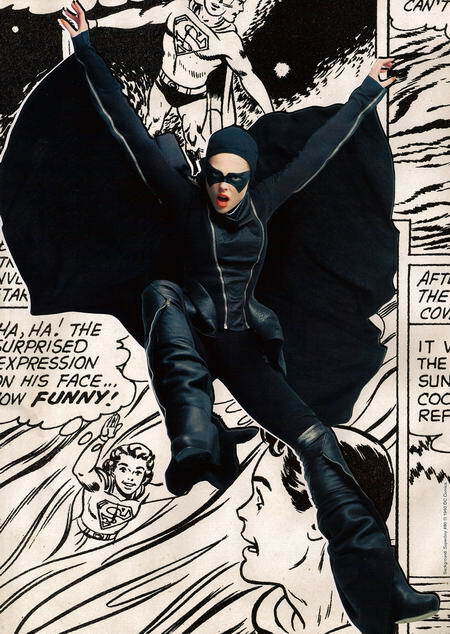 On a more fashionable note, here's a spread Coco Rocha did on Superheroes, Vogue US slightly old article of May 2008. 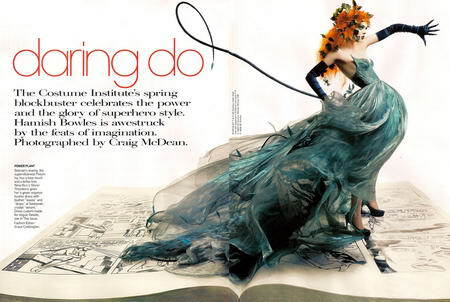 Coco Rocha does Poison Ivy with a Nina Ricci Swarovski embellished dress custom made for Vogue. Catwoman by Domenico Dolce and Stefano Gabbana with Christian Louboutin for Rodarte shoes. The Little Mermaid with Gaultier rubber bodysuit with shell detail and sequined detail. A Batman inspired custom made for Vogue Rick Owens zippered leather-and-cashmere suit. "None of you understand. I'm not locked up in here with you... you're locked up in here with me." when coco don the Little Mermaid suit. Nasty thrill of Gossip Girl?